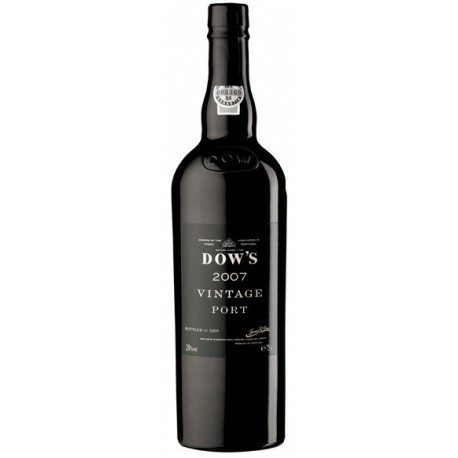 Dow's Vintage Port 2007 has a cherry burgundy colour. It's unique, refined and delicious, with lots of fruit, plums, cherries and cassis. Tannins firm, presenting a long and complex finish. Dominant notes of spices and raspberry jam. Rich and chocolaty. Dow's Vintage Port wines are made only in years of exceptional quality and are produced from the finest vineyards of Dow's Quinta do Bonfim and Quinta de Senhora da Ribeira. Each property contributes to a unique and distinctive style of the final batch of Dow's Vintage Port wines. Touriga Nacional, Touriga Franca, Sousão. Cherry burgundy colour. Unique, refined and delicious, with lots of fruit, plums, cherries and cassis. Tannins firm, presenting a long and complex finish. Dominant notes of spices and raspberry jam. Rich and chocolaty. Store at 18 ° C. Serves the temperature from 15ºC to 16ºC.